Encontrei 852 Hotéis em Kammalgoda. Escolha a data de entrada e saída para ver os hotéis disponíveis em Kammalgoda. Sem informar as datas, os preços com (*) são preços médios de cada hotel e nos arredores até uma distância de 10 km. Fiesta Holiday Home is a holiday home set in Weligama in the Galle District Region and is 3.6 km from Kushtarajagala. Guests benefit from free WiFi and private parking available on site. There is a dining area and a kitchenette equipped with fridge. A flat-screen TV is featured. There is a private bathroom with a shower. Bike hire is available at the property and the area is popular for windsurfing and diving. A selection of activities are offered in the area, such as cycling and fishing. 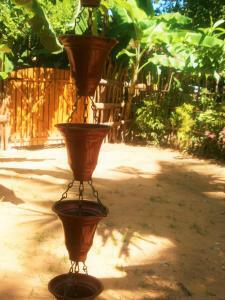 Themashi Holiday Resort offers accommodation in Denipitiya. The bed and breakfast has a terrace and views of the garden, and guests can enjoy a drink at the bar. Free WiFi is provided and free private parking is available on site. All rooms have a flat-screen TV. Some units feature a seating area for your convenience. Rooms come with a private bathroom equipped with a shower. The bed and breakfast also offers bike hire and car hire. Hikkaduwa is 43 km from Themashi Holiday Resort, while Galle is 27 km from the property. Located in Weligama, La Cannelle Cinnamon Plantation Villa offers an outdoor swimming pool and a restaurant. This self-catering accommodation features free WiFi. The air-conditioned accommodation will provide you with a flat-screen satellite TV, private pool and a patio. There is a fully-equipped kitchen with an oven and refrigerator. Featuring a shower, private bathrooms also come with a hairdryer. You can enjoy pool view and garden view. Extras include washing machine and work desk. At La Cannelle Cinnamon Plantation Villa you will find a garden, a terrace and a shared kitchen. Other facilities like an ironing service and laundry facilities are offered. Activities in the surrounding area include fishing. The property offers free parking. The Mattala Rajapaksa International Airport is located 81 km away. Featuring free WiFi throughout the property, Malsri Guest Denipitiya offers accommodation in Welipitiya, 41 km from Hikkaduwa. Free private parking is available on site. Every room at this guest house is air conditioned and features a flat-screen TV with cable channels and DVD player. Certain units have a seating area to relax in after a busy day. You will find a coffee machine and a kettle in the room. Every room is fitted with a private bathroom equipped with a bath and bidet. Extras include bathrobes, slippers and free toiletries. Free use of bicycles, bike hire and car hire are available at this guest house and the area is popular for snorkelling. Galle is 26 km from Malsri Guest Denipitiya, while Unawatuna is 22 km away. Featuring free WiFi, a barbecue and a sun terrace, O2 Villas - Weligama offers pet-friendly accommodation in Weligama. Free private parking is available on site. Rooms come with a flat-screen TV. Some units feature a seating area for your convenience. Enjoy a cup of tea from your terrace or balcony. Each room has a private bathroom. For your comfort, you will find slippers and free toiletries. This guest house has water sports facilities and bike hire and car hire are available. You can engage in various activities, such as snorkelling and diving. Featuring free WiFi and air conditioning, Randil Resort is located in Weligama, 2.9 km from Kushtarajagala. Free private parking is available on site. All units feature a seating area. There is also a kitchen, equipped with a dishwasher. Every unit is fitted with a private bathroom with slippers. Towels and bed linen are featured. Bike hire is available at the property and the area is popular for snorkelling. You can engage in various activities, such as windsurfing and diving. Located in Weligama in the Galle District Region, 2.7 km from Kushtarajagala, Banana Leaf Garden features a barbecue and views of the garden. Guests can enjoy the on-site restaurant. Free WiFi is available and free private parking is available on site. Certain rooms feature a seating area for your convenience. Bike hire is available at this resort and the area is popular for cycling. The resort also offers car hire. Offering a barbecue and views of the river, River View Villa Weligama is located in Weligama, 2.4 km from Kushtarajagala. Free WiFi is featured throughout the property and free private parking is available on site. Some rooms include a seating area to relax in after a busy day. Each room includes a private bathroom. Guests can enjoy various activities in the surroundings, including diving, cycling and fishing. The guest house also offers bike hire. Banyan Tree Guest Home is a holiday home with free WiFi, set in Weligama, 2.6 km from Kushtarajagala. It provides free private parking. Towels and bed linen are featured in this self-catering accommodation. There is a private bathroom with a bath. Bike hire and car hire are available at the property and the area is popular for snorkelling and diving. Located in Weligama, 2.9 km from Kushtarajagala, Bay Reach Home Stay features a sun terrace and views of the sea. Free WiFi is featured throughout the property and free private parking is available on site. Certain rooms feature a seating area for your convenience. All rooms have a private bathroom. Guests can enjoy various activities in the surroundings, including snorkelling, diving and fishing. The homestay also offers bike hire.